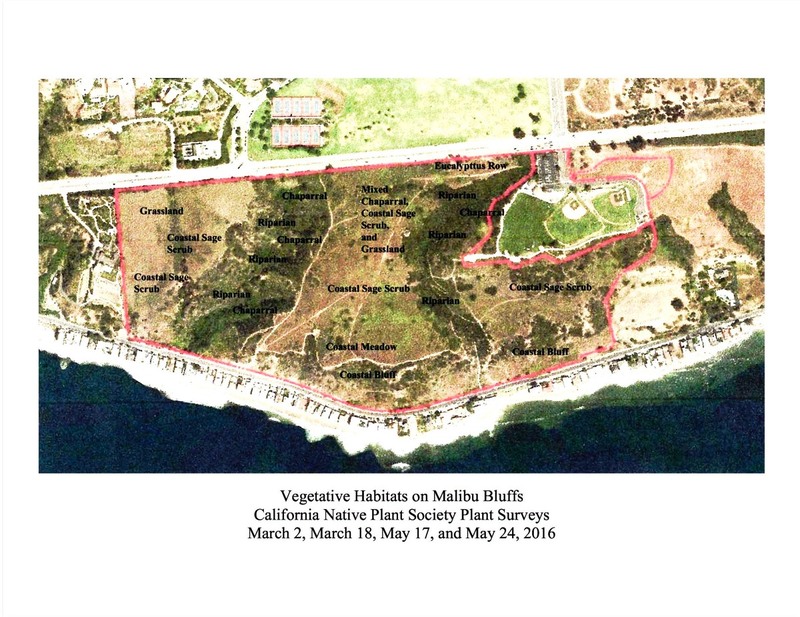 The City's "Malibu Bluffs Parkland" project involves developing a park master plan and an environmental impact report (EIR) for 84 acres of undeveloped open space and 10 acres of developed park space. The proposed "Malibu Bluffs Parkland" project site encompasses 84 acres of the undeveloped Open Space Preserve adjacent to Pacific Coast Highway (PCH), and directly south of Pepperdine University. 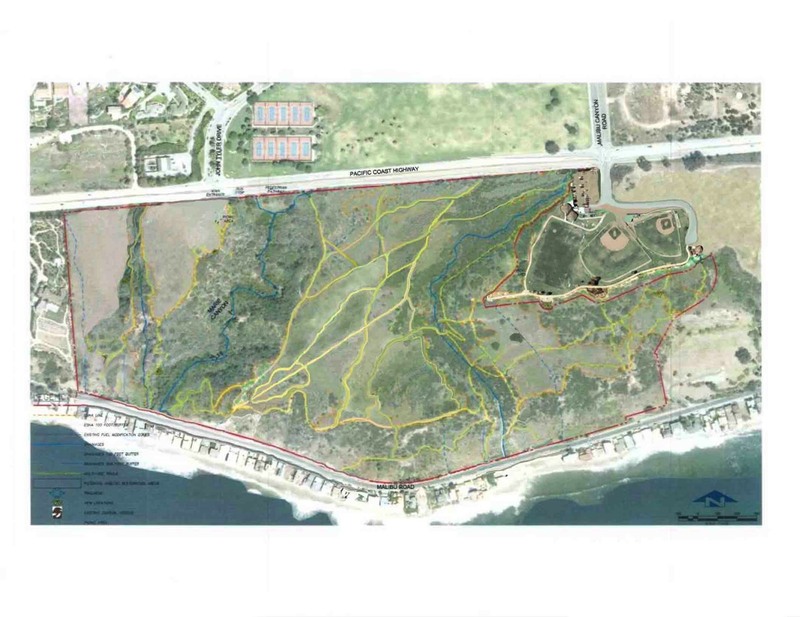 Master planning for the project also will include the 10 acres that make up Malibu Bluffs Park, and 1.75 acres of vacant land known as the Crummer Property. In 2013, the City Council approved a five-year land-use lease agreement with the Santa Monica Mountains Conservancy, transferring maintenance and operations responsibilities for 532 acres of the City-owned Charmlee Wilderness Park for approximately 84 acres of open space adjacent to the City’s 10-acre Malibu Bluffs Park. 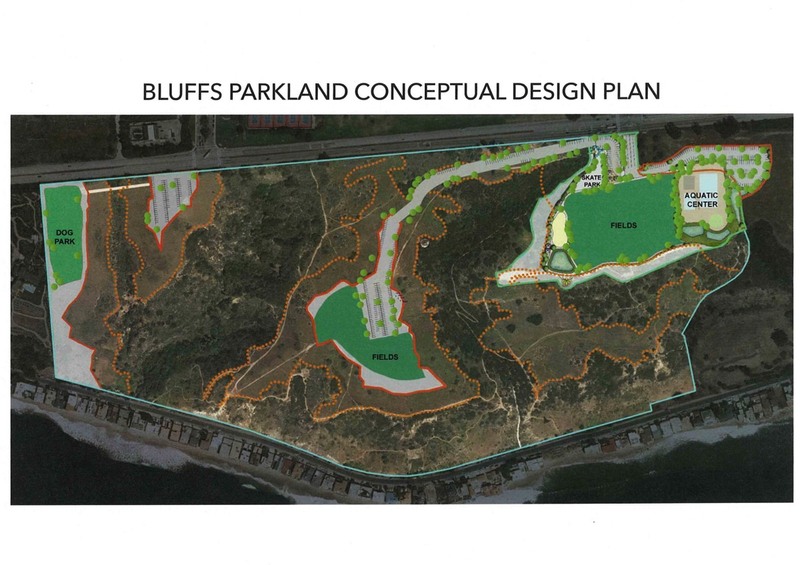 The agreement allows the City to access the property to assess the feasibility of developing recreational facilities if the transfer of Bluffs Open Space Preserve is swapped for Charmlee Wilderness Park. Illustration 3, below, shows the current City-designed "Parkland," which includes three baseball fields, two parking lots and two driveways on the Open Space Preserve. Bluffs Open Space Preserve and City-owned and developed "Bluffs Park" (at right side of red boundary with baseball fields) is shown below as it exists today. Below: Illustration showing bluff tops. Blue areas are canyon Blue Line streams and surrounding steep slopes which are difficult to access. Note: Bluff tops are divided into three sections. Mid Bluff top is ESHA where proposed ballfields are to be located. And at right (or the East) is the existing City-owned development called Malibu Bluffs Park. Proposed baseball fields, driveway, and parking lot (in final page illustration below) are shown to be located in an environmentally sensitive habitat area containing Mixed Chaparral Habitat and Coastal Sage Scrub Habitat ESHA (immediately below). 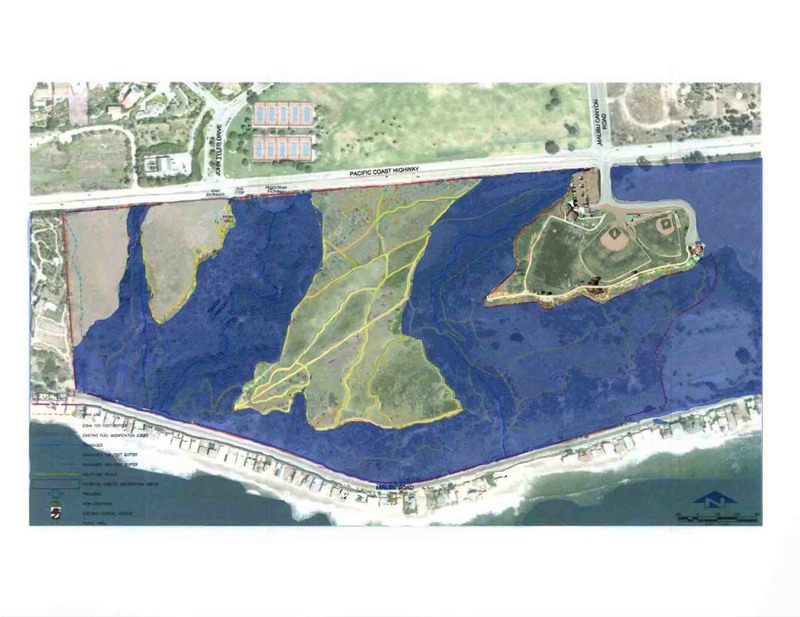 The illustration below shows the September 11, 2017 Malibu City Council Approved Project for Bluffs Open Space Preserve and redevelopment of the City-owned park. As seen in the previous illustration, note that the ball fields and parking lot are placed in Chaparral/Coastal Sage Scrub Habitat areas, which are ESHA. And the driveway does not meet the required setback from canyon stream ESHA.